Brie Lowry, a graduate of TCU, now dances with Kentucky Ballet Theatre. In the highly competitive world of ballet, a college degree may seem like a costly detour. Performance careers only last for so long, and ballet is more physically demanding than most. But a ballet degree can provide the personalized instruction, professional networking and repertory exposure necessary to transform students into artistic directors’ dream dancers. We spoke to college graduates and faculty members to uncover the most common misconceptions about ballet degrees—and the truth. Myth #1: Ballet degrees are for dancers who aren’t good enough to dance professionally. Busted: Not true! Many of today’s college ballet programs focus on performance and professional preparation. Brie Lowry, who now dances with and serves as executive director for Kentucky Ballet Theatre, earned her BFA in ballet at Texas Christian University—a decision she originally made to appease her parents, who she knew wouldn’t let her skip college. 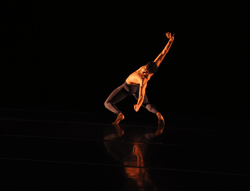 Andrew Harper, a ballet BFA grad from the University of North Carolina School of the Arts (UNCSA), values the emphasis on improvisation and composition in a college dance program. “I’ve worked with many choreographers who ask their dancers to generate or modify movement phrases and improvise,” says Harper, now a freelance dancer in New York City. “This can be very intimidating for dancers who have always been given specific instruction and steps and haven’t been required to engage their own creative minds.” Elizabeth Gillaspy, dance program director at TCU, agrees. “Today’s dancers are expected to work in collaborative ways—that’s a big part of what can be gained in an educational environment,” she says. Myth #2: A ballet degree doesn’t translate to the real world of professional ballet. Busted: Lowry felt prepared for the grueling audition circuit, thanks to her time at TCU. “I felt I could learn choreography better and learn combinations more quickly, because I’d had that really broad university experience,” she says. At Butler University in Indiana, the dance program’s performance company, ButlerBallet, regularly produces professional-quality, full-length classics, like Swan Lake, Coppélia and Giselle, complete with live orchestral accompaniment. More modern works, like George Balanchine’s Serenade, Antony Tudor’s Dark Elegies and Nacho Duato’s contemporary ballet piece Por Vos Muero, are also a part of the performance catalog. “Such a vast repertory makes students much more versatile performers and much more valuable to an artistic director,” says Larry Attaway, Butler’s dance department chair. Myth #3: Ballet training will take a backseat to academics. Busted: Gillaspy maintains that dance students are adept at time management. After all, she says, “they’ve been juggling intensive studies of dance with homework, school and friends since they were 8 or 9 years old!” An intensive dance schedule—at UNCSA, Harper took daily technique class, plus partnering, contemporary and men’s classes— ensures technique won’t fall by the wayside. Many schools encourage ballet students to take advantage of nondance academics—some even offer dancers the chance to double-major, for those looking to give themselves a leg up in their postperformance careers. At Butler University, for example, ballet students have completed additional degrees or minors in English, anthropology, peace studies, math and physics. Myth #4: College ballet students can say good-bye to networking with companies and choreographers. Busted: Helping students make contacts in the dance world is a priority for ballet degree programs. While in college, Lowry worked as a program administrator with Vermont’s Burklyn Ballet Theatre and as an assistant ballet mistress to American Ballet Theatre’s Franco De Vita. Harper credits his success as a freelancer entirely to his college years. “I’ve gotten one job from an audition,” he says. “Everything else is friends I made at school, choreographers looking for people and networking.” Plus, most schools also offer resumé help, assistance with setting up auditions and preparing performance materials. Kat Richter is a freelance writer and professor of anthropology. She lives in Philadelphia. Don’t miss a single issue of Dance Teacher.